The employment ambitions for the False Creek Flats continue with another office building submitted as a Development Permit. This is for a 7 storey, 144,000 square foot building with a ground floor restaurant, already rezoned but now designed by MGA (Michael Green Architects) for Triovest Holdings. The design of the new proposal is quite different from the first version, as the new structure appears to be a mass timber frame structure, rather than reinforced concrete. White terracotta is proposed as the primary cladding material. The building will have connections to a new District Energy Heating system, and proposes a reduction in parking (with just two floors of parking), justified by adding improved bike facilities and car share spaces at grade. There will be green storm water management, and planted rooftop terraces. 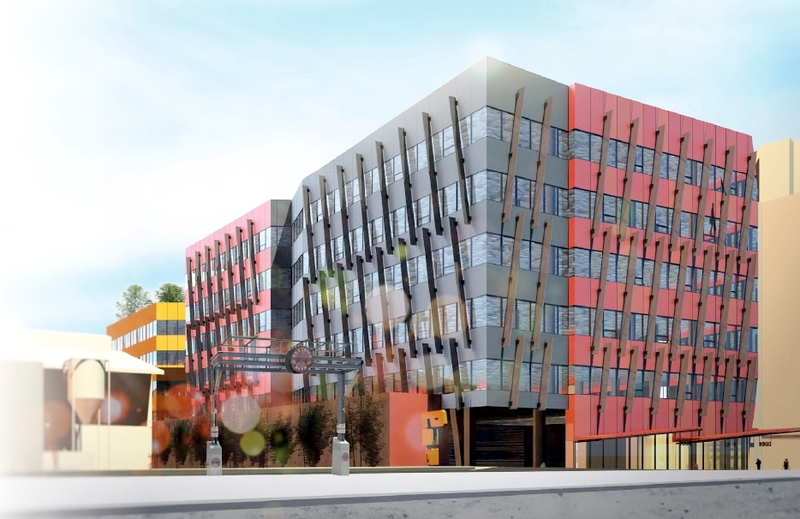 Originally, the rezoning designed in 2017 by IBI for Porte Holdings and the Reliance Group proposed bold colours to compliment the design for an adjacent precinct of buildings for Onni. This entry was posted in False Creek and tagged MGA, midrise, office. Bookmark the permalink. What a bland piece of architecture. The original proposal would definitely add more visual interest to the neighbourhood.